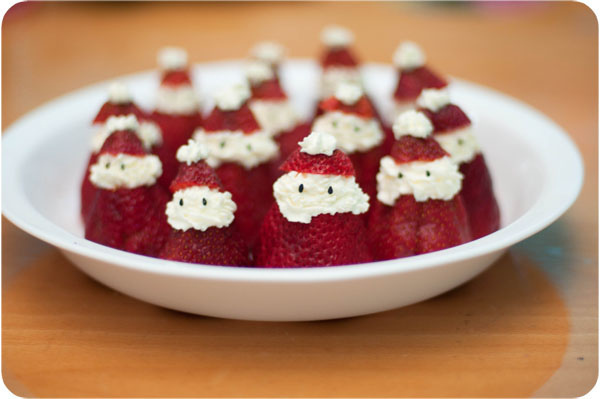 If you loved the Santa hat strawberry brownies but could use an idea with less brownie, try these cute Santa strawberries. You can pipe them with plain whipped cream or some fruit dip and you will have a cute and semi-healthy holiday treat. You can see these cute strawberry Santa treats over at Absolutely Ayana. So cute - and easy! Great idea! How does someone think this up!?! This is so adorable! And why I LOVE reading blogs. Agree, that you doing a new and great things with food. Designing on food is very hard for me. Because I just starting do on it but never make it more beautiful like your work.